French painter, printmaker, draughtsman and administrator. Although he painted a number of rustic genre scenes and was an occasional designer of vases and picture frames, he was principally active as a painter of large-scale history and religious works. In this aspect of his output he forms a link in the 18th-century tradition of French history painting that runs from Jean Jouvenet to the Neo-classicism of Jacques-Louis David. He became academician in 1742, director of the Acadmie in 1778. He was First Painter to the Duke of Orlans, then to the King in 1770, replacing Boucher. He was director of the Gobelins, the Muse des Gobelins has many tapestries made after his cartoons. 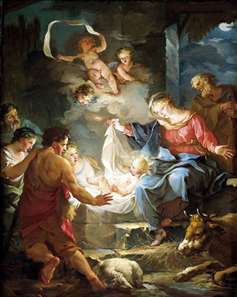 See more details about "Nativity"